Share Galaxy workflows in a controlled way (e.g. 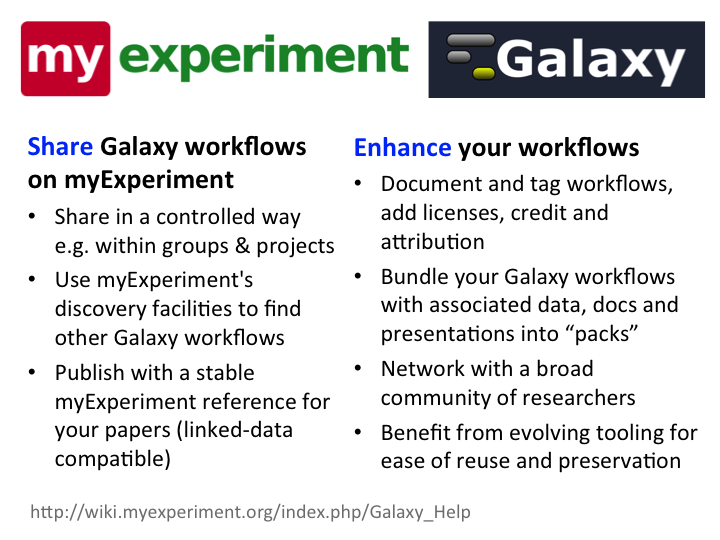 within a project), publish them with a stable myExperiment reference for your papers (which is linked-data compatible), and use myExperiment's discovery facilities to find more Galaxy workflows as content grows. Use the social website features directly to document, tag and discuss workflows, add licensing, credit and attribution, and to bundle your Galaxy workflows with associated data, documents, presentations etc into myExperiment "packs" for ease of reuse and preservation. Benefit from a central workflow website with a broad community, which means you can manage workflows for multiple Galaxy installations, attract visitors to your workflows and research, and network with others. Benefit from the evolving tooling and preservation capability of myExperiment through the Wf4Ever project. In addition to our Linked Data URLs, we have arranged for myExperiment to be publishing DOIs later in 2012. When using Galaxy you can import Galaxy workflows from myExperiment by choosing "Upload or import workflow" in Galaxy's workflow menu, then the new "Visit myExperiment" link at the bottom of the page. Within the myExperiment interface you can then view a Galaxy workflow and select "Import this workflow into Galaxy". Some Galaxy tutorial workflows are currently available to help you try this out. To export Galaxy workflows to myExperiment you'll first need a myExperiment username and password, then you'll be able to upload Galaxy workflows and also make them visible to others if you wish. To create a username and password go to http://www.myexperiment.org/ and register. Having a username and password enables you to benefit from all the features of the site. To export a Galaxy workflow to myExperiment select "Download or Export" from Galaxy's workflow menu, enter your myExperiment username and password in the "Export to myExperiment" section and click the "Export" button. Exported workflows are set to be "Private" by default but you can make them visible publicly or to friends, groups etc by clicking on "Click here to view the workflow on myExperiment" and changing the Sharing settings. Visit http://www.myexperiment.org/ at any time to change settings, add further description, tags, license etc, and to create "packs". You can also create and administer groups, link up with friends and network with other workflow users. Contact Us if you have any questions. And please spread the word - we also have a flyer and slide. Thanks to Finn Bacall, Don Cruickshank and Danius Michaelides in the myExperiment team for all their work with Jeremy Goecks and colleagues in the Galaxy team on the integration.